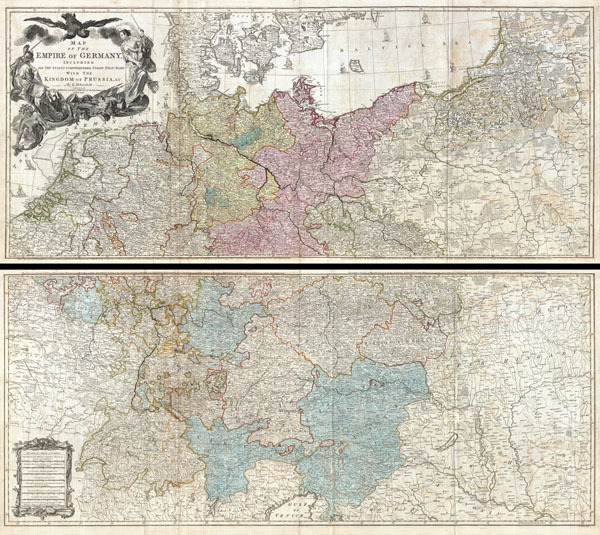 An absolutely stunning and monumental two panel 1794 wall map of Germany, Bohemia, Austria and Prussia by Louis Stanislas d'Arcy Delarochette. Covers Germanic territories in full from the Baltic Sea to the Gulf of Venice. Includes Germany, Austria, Bohemia (Czech Republic), Poland, Lithuania, Prussia, Switzerland, Holland (the Netherlands), Belgium and Denmark. Offers an extraordinary level of detail throughout, noting roadways, towns, castles, monasteries, forests, swamps, rivers, cities and mountains. Even offers some offshore detail near Belgium and Holland. An elaborate allegorical title cartouche in the upper left quadrant depicts the German janiform eagle overlooking two warrior women and an assortment of military paraphernalia. Under it all, a baleful Medusa looks on. this is the 1794 updated edition of a map originally published in 1759. Published by Laurie and Whittle as plate nos. 18-19 in the 1797 edition of Thomas Kitchin's General Atlas. Louis Stanislaw d'Arcy Delarochette (1731 - 1802) was a British cartographer active in London, England in the late 18th century. Dealrochette produced numerous maps in conjunction with various other contemporary British cartographers including Faden, Jefferys, Laurie and Whittle, Arrowsmith, and Bowles. Delarochette is best known for his monumental eight sheet map of South America, which was used to settle numerous border disputes throughout the continent. He also produced an influential map of the Cape of Good Hope. Very good condition. Original folds. Minor offsetting. Blank on verso. Original platemark visible. Wide clean margins. Light offsetting. Four sheets, joined in two panels. Rumsey, 2310.039, 0411.022, 0411.024, 0411.023, 2310.038. OCLC 7160203. Phillips (atlases) 699. Shirley, R., Maps in the atlases of the British Library, T.LAU-1c (1799 ed.). National Maritime Museum, 375 (3rd ed. 1801).